Most of the products featured in this post were given to me by Island Batik. The Amazon link contained in this post are affiliate links, meaning, at no additional cost to you, I will earn a commission if you click through at make a purchase. I'm a few days late for the Island Batik November challenge. (This really is something I plan on working on in 2019!) 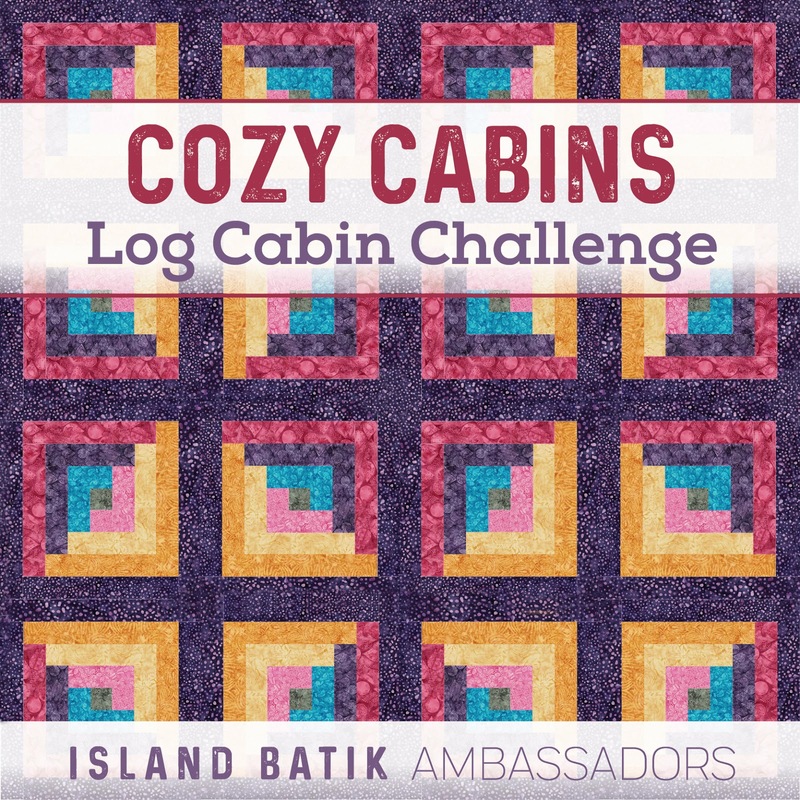 For November, we were challenged to incorporate a log cabin block or log cabin variations into our project using any of our Island Batik fabrics. As a modern quilter, I enjoy putting a modern twist on traditional quilt blocks. In searching for ideas, I found the book "Log Cabin Restructured" at my local library. (I ended up not making a project from this book for my November challenge, but it is definitely going on my Christmas wish list. The curved-piecing butterflies shown on the cover will be the first project I make.) After going through my fabrics, I decided to use my IB Lavender Sage Island Stacks (10" x 10" squares). 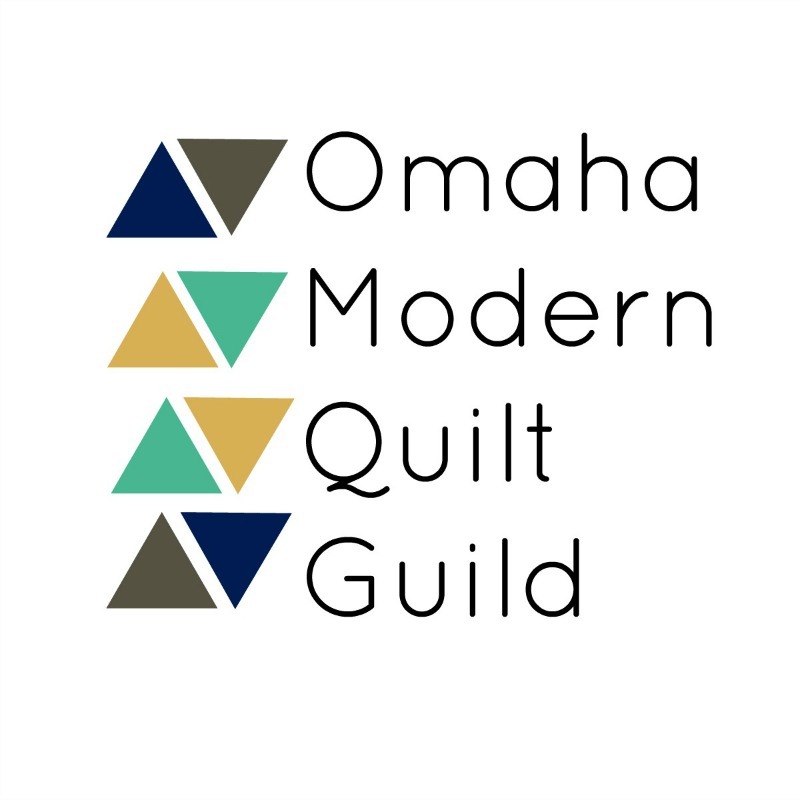 When I make a quilt, I often start with an overall idea of either the blocks or quilt I want to make, but I figure out things like size and layout as I go. 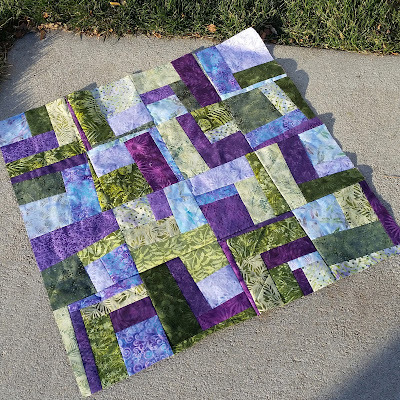 I started by cutting these gorgeous purple, blue and green fabrics into smaller squares and strips to make a stack of quarter log cabin quilt blocks. They resulting quilt blocks were nice but a little boring so I make them wonky by trimming the blocks using an 8.5" ruler placed at various angles and orientations on each block. I'm realizing I don't do a very good job of taking progress photos of my work, but here is the quilt top with the first 16 blocks sewn together. And here is the completed quilt! Part of the reason my post is late is due to weather. It was raining out on Friday and Saturday, but at least today is just lots of snow, wind and poor lighting. 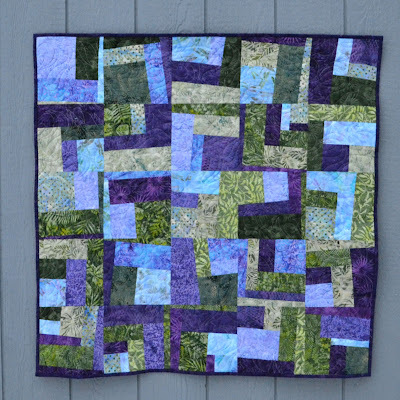 I like that you have to look close to see that the blocks are, indeed, a log cabin variation, and I like the improv look the quilt has. (This would be a fun pattern to try again with just 2 or 3 solid colors.) I was able to make 25 blocks using most of the Island Stacks, and the quilt ended up 40" x 40"...a perfect size for a baby quilt! 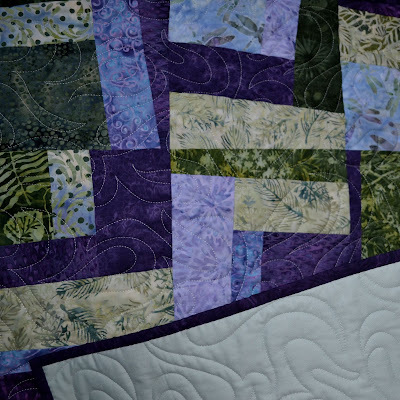 I backed the quilt with a pale green Kona solid I have had in my stash forever. 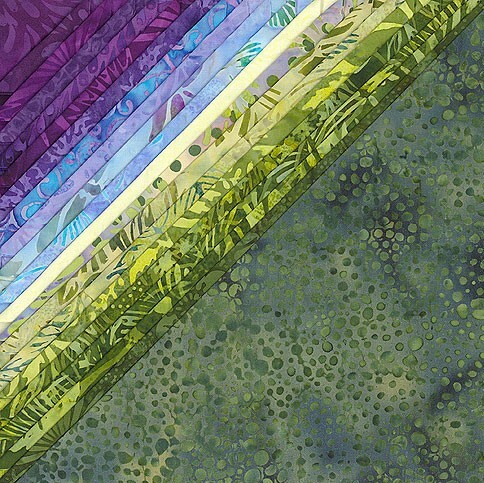 I remember buying multiple yards of it because it was on sale, and I thought "building a stash" meant buying lots of fabric when you found a good deal. It worked well with this quilt, though, so I'm glad I had it. There are just two projects left for the 2018 Island Batik Brand Ambassador. Applications for the 2019 Island Batik Brand Ambassador Program are being accepted through December 7. I have reapplied for 2019, and fingers crossed I'll be accepted again. It has been such an amazing experience. You can apply online here! 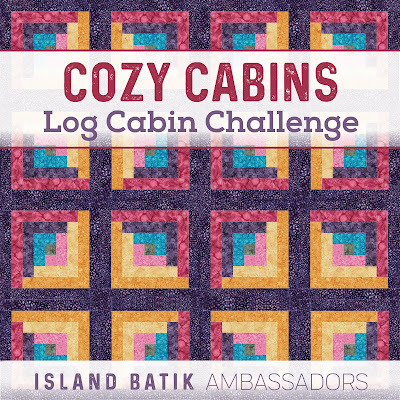 Improv log cabin was perfect for this challenge. I love the colors and the way it turned out. The quilting is pretty terrific too.